Update 2.1 Notes: Blitz Mode Beta & Epic Mystery Chest! Blitz Beta is a new gameplay format designed for short, five-minute sessions. It is still very much in development and will likely evolve with time, based on community feedback. Let’s say you have a set amount of time to play a game. Maybe you’re on a bus and your stop is coming up or you’re waiting in line at the movies. 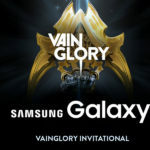 Wouldn’t it be great to be able to jump into Vainglory and know exactly how much time it would take to finish a match? That’s the thinking behind Blitz. 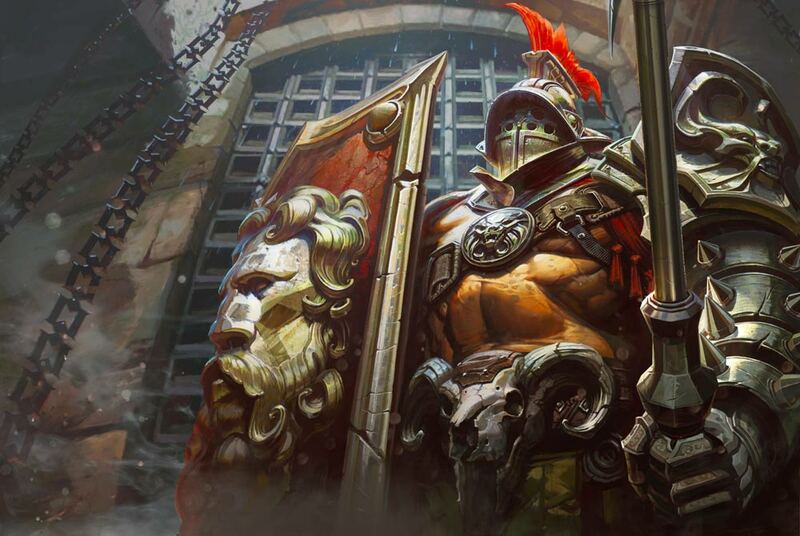 Whereas Battle Royale and Casual matches are objective-based and can go on indefinitely, Blitz is the first mode in Vainglory to have a countdown timer and a definitive end. Now, you can hop into a quick, intense match when you only have five minutes to spare — and know it will end when you need it to. Blitz Mode also debuts a handy new “Quick Buy” feature. When players are near their shop, they will see the icon of the next recommended item for their hero’s build. Simply tap on the item’s icon to purchase it. The icon will be replaced by the next item in the build if the player has enough gold. If they don’t have the gold, no icon will appear. This is a great feature for new players who can often be overwhelmed by item options but won’t limit veterans who still want to shop for a specific build. We saw an opportunity to add a more compact, quicker gameplay mode that is great for new players and incredibly fun and fast for all players. We hope Blitz Beta delivers on that promise, giving players the perfect opportunity to try out a new hero, item build or strategy in an action-packed session. The five-minute game ends one of two ways: Reach 15 points or run out of time. A team scores points by killing enemy heroes or taking out objectives. You and your teammates will have to strategize what is more important — the lane or the jungle — and either play conservatively or aggressively depending on how close you are to 15. Suddenly, chasing down that fleeing Koshka takes on a whole new level of tension — securing the kill will bring your team closer to victory but if you’re caught and killed, then it could be game over. 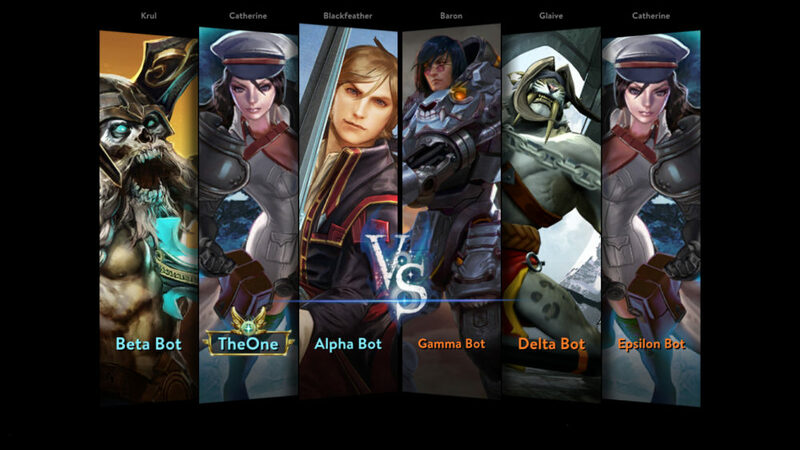 Players start the match at Level 9 and with 6000 gold. So, you get to test your new item build strategy immediately. Maybe you start Lyra with Shatterglass and overdrive her Imperial Sigil. Or maybe you start with a Fountain of Renewal or Contraption and focus on keeping teammates alive. Blitz Beta is still in many ways a work in progress, but we’re excited to share it now and get as much feedback from you as possible as we look for the perfect five-minute version of Vainglory. We can’t wait for you to try it out! At 5 minutes, team with higher score wins. Players start the match at Level 9 and with 6000 gold. Hero respawn rate is 12 seconds at all times. Lane minions and jungle monsters are worth more gold & XP than standard modes. 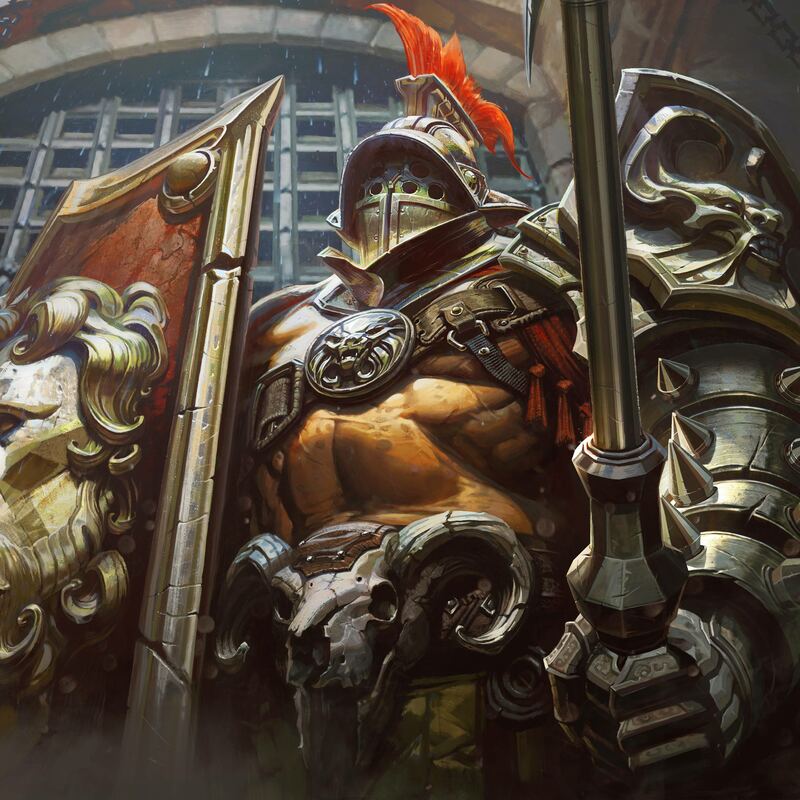 Vainglory Update 2.0 introduced the Mystery Chest, offering players the opportunity to get any hero or skin in the Market — including all the Special Edition skins that usually require massive amounts of Opals. Player feedback has been overwhelmingly positive, and we’re excited about what new opportunities this provides going forward. In Update 2.1, the Mystery Chest will be renamed the Rare Mystery Chest. Why the change? We wanted to leave room for an offering even more… epic. For a higher price, the Epic Mystery Chest guarantees better payouts and a chance at a 1 MILLION ICE JACKPOT. That’s not a typo. Imagine what you’d do with 1 million ICE in your account. Use an Epic Mystery Key to unlock this new chest for 999 ICE. Each chest contains at least six cards including one hero, one skin and 20 Opals guaranteed! There’s also an increased chance of getting an Epic skin or higher or a Special Edition skin. 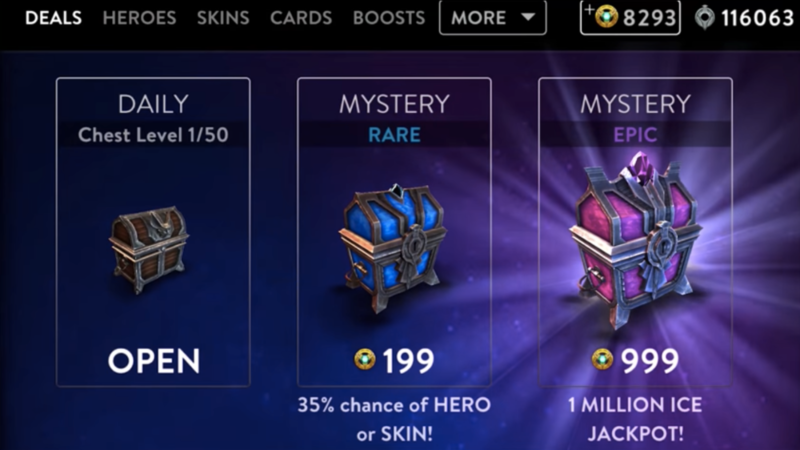 The Epic Mystery Chest will include every hero and skin sold in the Market … plus a few surprise unreleased skins scheduled to hit the Market later on. If you receive a duplicate of a skin or hero you already own, you get 20 Opals instead. In addition to a chance to win a staggering one million ICE jackpot, the Epic Mystery Chest also offers a potential huge payout of 100,000 ICE. The Epic Mystery Chest: Better, more reliable payouts and a chance to score 1 million ICE. 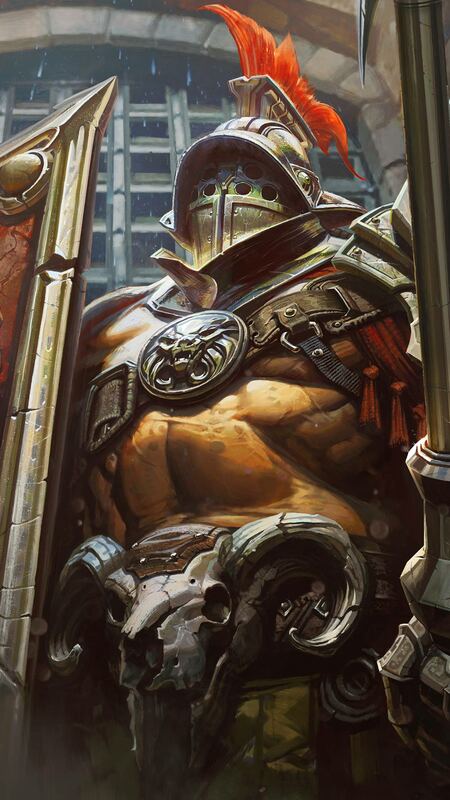 Vainglory is a shared journey with a community that shapes our product roadmap, heroes, skins, lore and gameplay. Together, we’re making this game better. With the introduction of the Rare and Epic Mystery Chests, we wanted to do something for the players within this community who take the extra step to support Vainglory financially. That’s why we’re introducing the Supporter Badge. If you’ve bought ICE in the past 30 days, you’ll see a new signifier on the VS screen of every match. 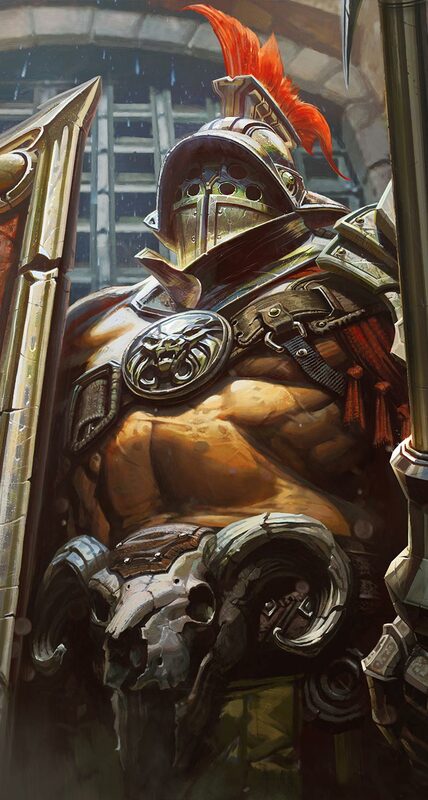 Thank you for helping make Vainglory what it is today. We know your money is precious, and we sincerely appreciate your support. 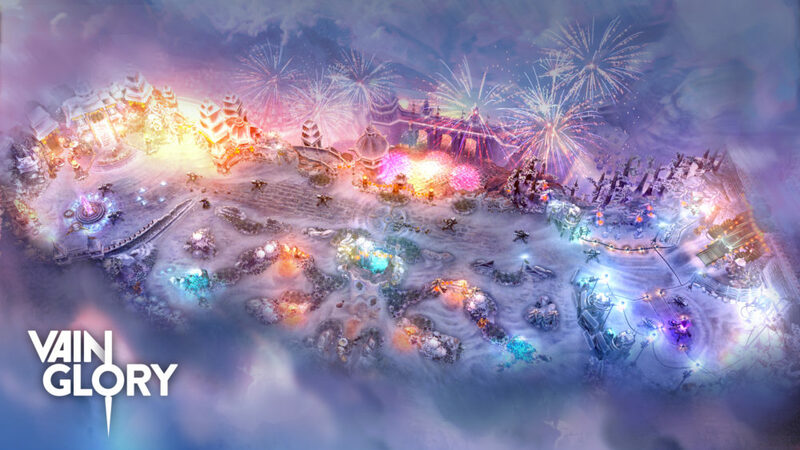 To celebrate the Lunar New Year, the Halcyon Fold has turned festive. Look for red paper lanterns, fireworks and golden statues to celebrate the Year of the Rooster. Use the mini-map to explore all its detail. 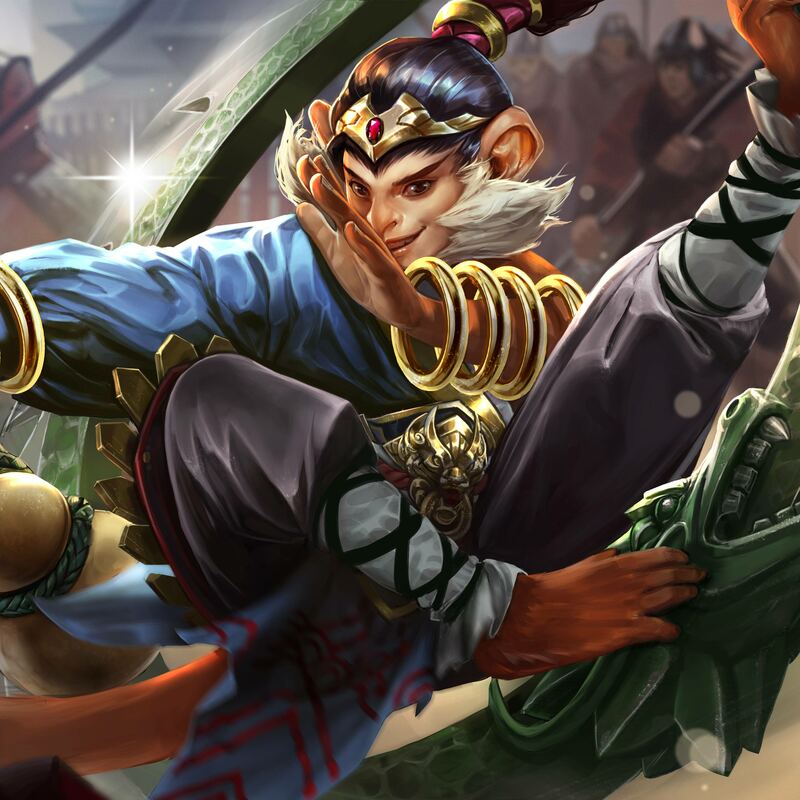 These changes to the Halcyon Fold create many interesting options when approaching a match. Opportunities for quick invades, early jungle aggression and alternative jungle rotations set the stage for a much more dynamic game. In Update 2.1, the Crystal Miner packs an even stronger punch, but it also takes longer to respawn and now has a set number of lives, after which it will no longer respawn. 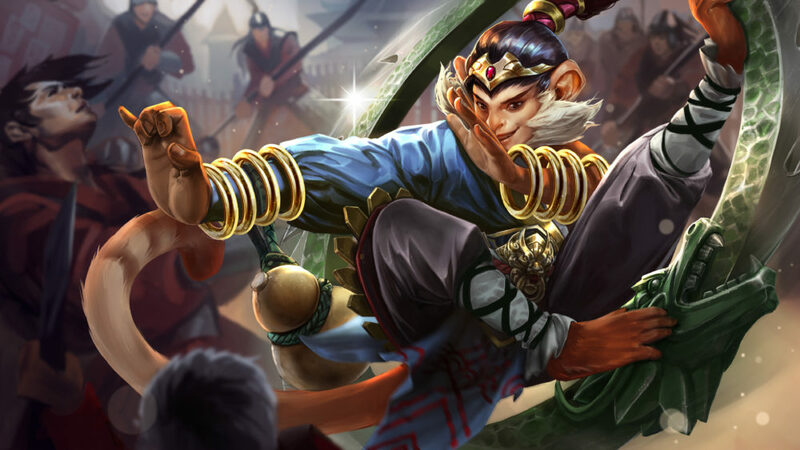 You can now invade the enemy jungle more effectively, but it’s a risky strategy. 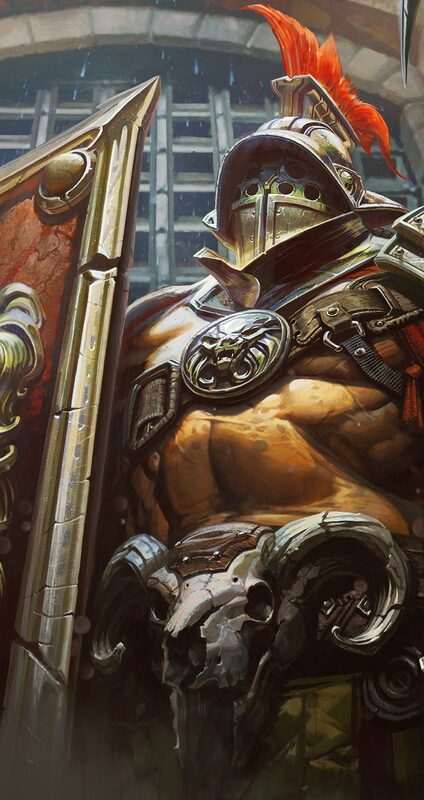 Vainglory now remembers your preferred skins from game to game. If you always like to use Petal’s Pumpkin Spice skin, for example, select it once and it becomes your default for future matches. Resetting your default skin is as simple as choosing a different skin. 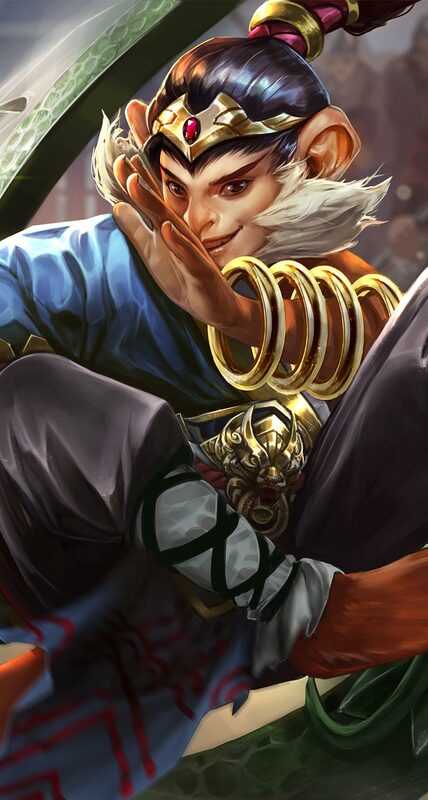 Bringing Taka’s defensive stats up to par with most other heroes. Bringing Fortress’ defensive stats up to par with other heroes. This ability now makes more sense. Previously, an allied hero just outside the range of the mark would not be granted move speed even if they entered the range shortly after. Since this ability is meant to primarily support Samuel, the amount of damage it did was a bit higher than necessary. Putting the removed Adrenaline attack speed back into her base stats. With the attack speed removed from this heroic perk, Kestrel no longer has the faster reload time on Glimmershot. The delivery system of this item has now been changed from a single slow moving projectile that item silences to a single fast moving projectile that marks its target, then detonates after a substantial delay. The item silence only triggers after the delayed detonation, meaning both the projectile and the detonation can be Reflex Blocked. Gwen’s Buckshot Bonanza and Aces High descriptions now properly indicate that they deal weapon damage. Glaive’s Bloodsong deals damage in three separate ticks (dealing 70/20/10% of the total damage respectively). Fixed an issue where Idris didn’t have the standard 33 minion defense present on all melee heroes. Fixed bug where the bonus CP from Clockwork didn’t increase the crystal damage of Idris’s ranged basic attacks. Joule’s Rocket Leap description now more accurate describes what it does. 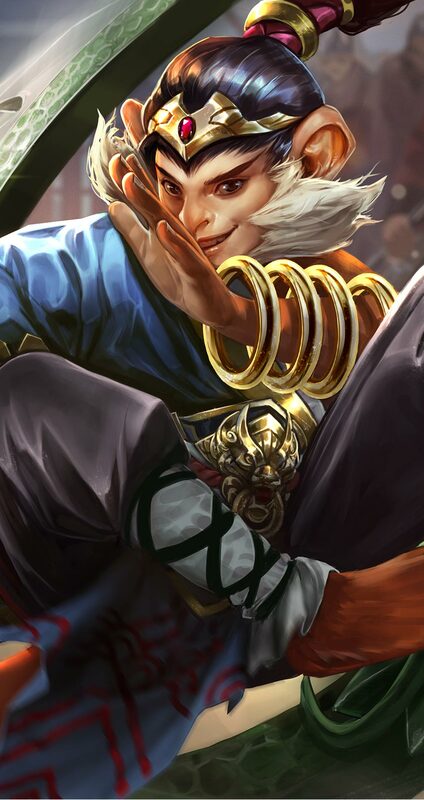 Koshka’s Twirly Death description now accurately reflects the lowered empowered attack cooldown. Fixed a bug where purchasing Echo, Slumbering Husk, Poisoned Shiv or Nullwave Gauntlet didn’t show in the battle log. Fixed a bug where Echo incorrectly allowed you to activate it during the execution of certain abilities such as Skye’s Forward Barrage, but it would not actually reset their cooldown. Fixed a bug where all buff icons were showing up in Spectator Mode. Stormguard, Bloodsong, Spin Up, Spectral Smite, Truth of the Tooth, Boomstick, Shroudstep and Shimmerstrike buff icons no longer show up in Spectator Mode. Fixed a bug where fortified health was not showing tick marks. Fixed a bug where items would be deselected as you switched shops. 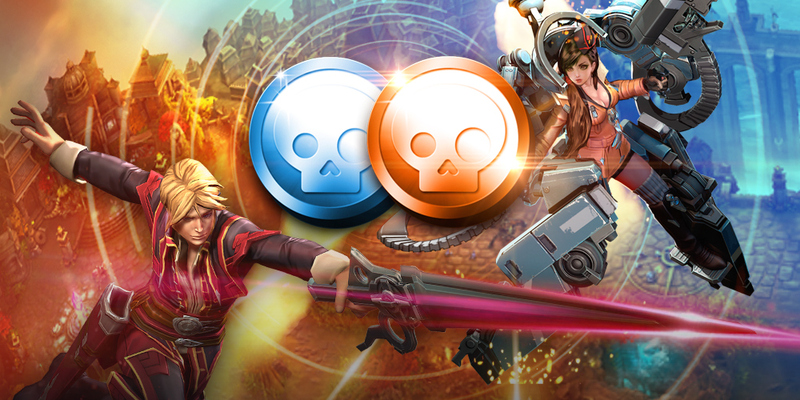 Remember: If you enjoy Vainglory, please rate the game in the iOS App Store, Google Play or Amazon Appstore. 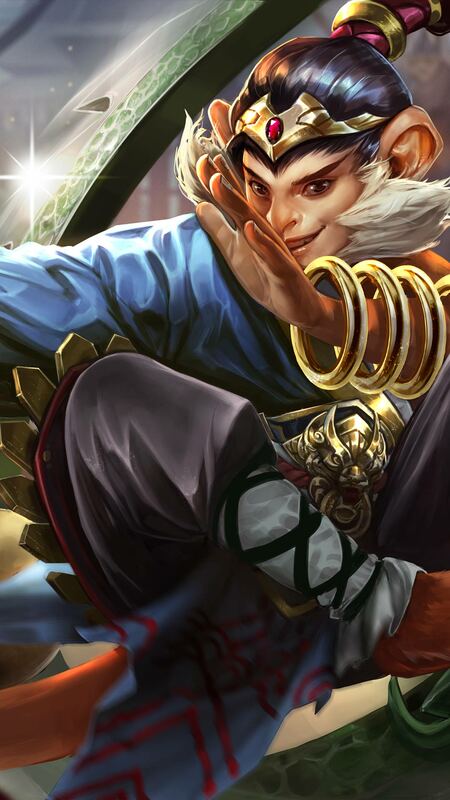 Spreading the word about Vainglory is a great way to grow the community! 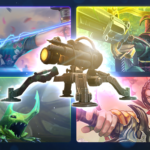 Battle Royale BRAWL Event: Destroy Turrets for a Chance to Win!